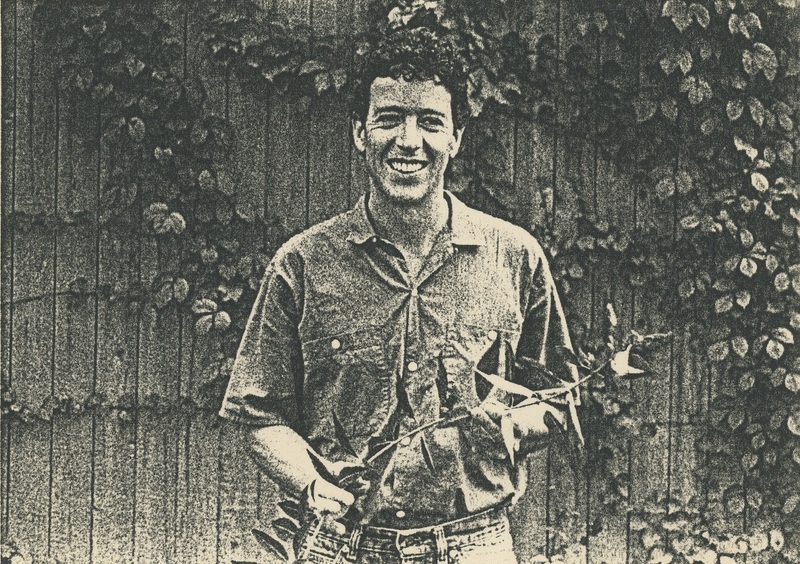 Kevin C. Shank in the Miracle Garden on the Lower East side, Manhattan, 1987. The AIDS Memorial quilt for Kevin Shank displayed in Washington, D.C.
A well-traveled plantsman with an extensive background in horticulture, Kevin C. Shank left his mark on the NYC community gardening scene. He served as GrowNYC’s Gardens Director from 1985-88, and was Vice Chairman of the Green Guerillas, with a heroic dedication towards revitalizing NYC through community gardening. After graduating from SUNY Delhi and Cornell University, Kevin was the Founding Horticulturist at the Pinkerton Garden for the Madison Square Boys & Girls Club in Manhattan. This intergenerational community garden included a state-of-the-art greenhouse and a rigorous after-school program for inner-city kids. After this, Kevin moved on to the Group Live-In Experience Farms, which was the talk of the town in the late 80s in NYC. 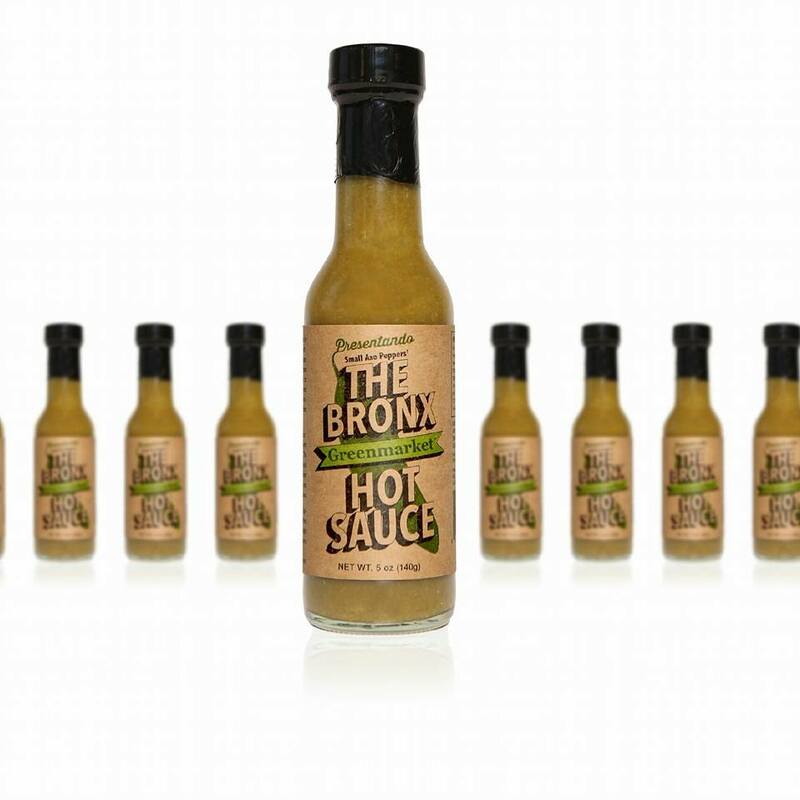 Growing and packaging fresh herbs for high-end restaurants in a state-of-the-art greenhouses in the South Bronx was unheard of then. Kevin went on to put his expert plantsmanship to good use in his final days as Senior Horticulturist at the Cathedral of St. John the Divine, on the Upper West Side. He will be forever remembered as one of the great contributors to the NYC community gardening community. This fall GrowNYC will build its 100th community garden. To celebrate, we are sharing stories from GrowNYC gardening history! 100 Gardens - Marian Heiskell, GrowNYC's "Living Landmark"
Marian S. Heiskell (center holding bouquet), along with parents, students, and representatives of the Salvation Army, GrowNYC and the Midtown West School. Marian S. Heiskell Garden, 315 West 48th Street, completed in 1997. It’s been almost 50 years since Marian Heiskell accepted Mayor Lindsay’s nomination to become Chair of GrowNYC! A forward-thinking conservationist who didn’t believe “urban environment” was an oxymoron but an opportunity, she worked tirelessly to convince fellow New Yorkers of the same. Since that time, Marian has made countless efforts to preserve New York’s green space, earning the honor of the title “Living Landmark” and a park named after her! Today she serves as Honorary Chairman on the board of GrowNYC. 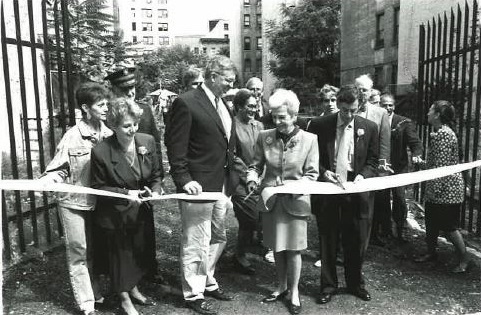 Read more about 100 Gardens - Marian Heiskell, GrowNYC's "Living Landmark"
Richard Abrons, Liz Christy, and former Mayor Ed Koch (holding a zucchini) at a Plant-A-Lot Garden opening in the early 1981. 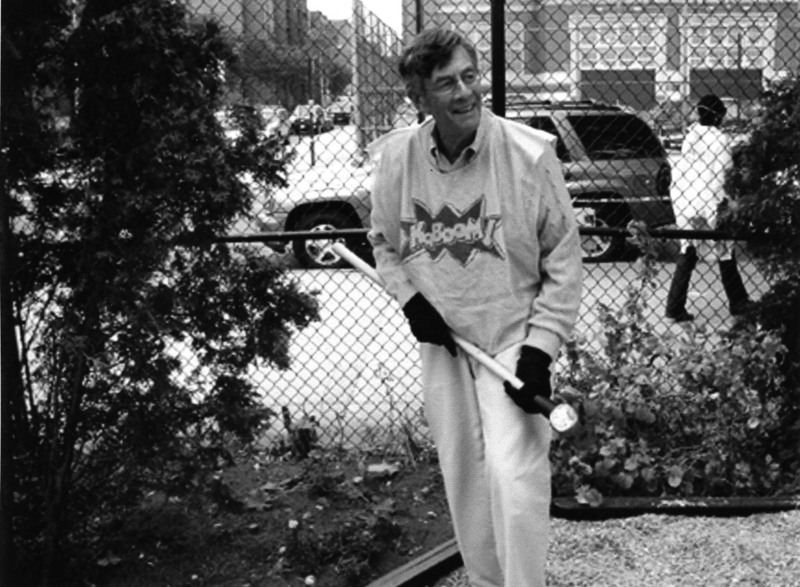 Richard Abrons has been one of GrowNYC’s gardens’ greatest supporters. In 1978, Richard and Liz Christy founded Plant-A-Lot (PAL), a material and technical resource for underserved neighborhoods where volunteers devoted years of sweat equity to convert vacant lots into community gardens. Richard and Liz partnered on 17 projects before Liz passed away in 1989. PAL is active today and leveraged millions of dollars of private funding for many of the community gardens and park playgrounds known as Lots-for-Tots throughout the five boroughs. A New York City treasure, Richard is a generous philanthropist, serves on the board of GrowNYC, and is also an author and playwright! Thank you, Richard!